Recently, Milagros, a young woman in an impoverished community we serve, graduated from beauty school with help from many friends of the ministry who answered a leading of God’s voice. 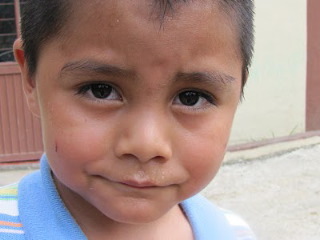 This journey began about three years ago when an audiologist came to visit the Rio community where Milagros lives. He met her and her mom and was moved by God to help Milagros, who is deaf and has learned to use her own version of sign language. During the course of the three years, God provided her with hearing aids to help her hear sounds for safety. She attended school to learn sign language. After about 1 1/2 years in beauty school, she has graduated and got her degree. She very well may be the only one in her community who has graduated from anything. Milagros means miracle in Spanish. 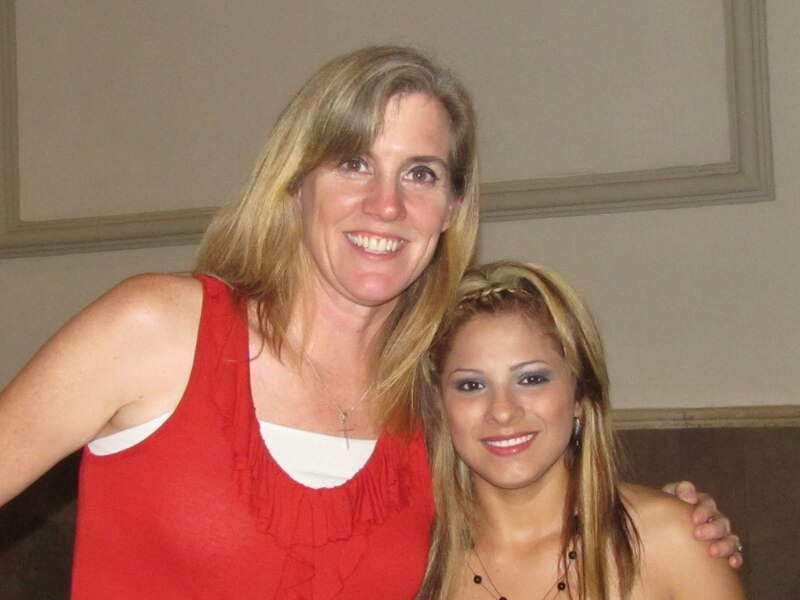 I know Milagro’s mom has seen her name come true in many times throughout her life, especially so several weeks ago at her graduation. Graduation day was full of presenting her work, judges results, dinner, along with mingling with teachers, friends and family. Milagros was quiet, humble and yet exuded confidence as she presented her model who had makeup, hair, nails, etc. all done by Milagros. Her teacher spoke for her to explain to the judges all Milagros had done. You could see communication had not been a problem between her friends and teachers. When she went up to accept her diploma, there was not a dry eye at our table. God clearly has a plan for this girl. Now, we are trusting that God will lead her to a trusting employer. Because of her unique style of communication Milagros needs to have a secure place to work, a place where someone won’t take advantage of her. Pray that God will lead her to this place. Manantial de Amor (MDA) has three different locations. With three light bills, water bills, and three of everything else, they have often found themselves in need. This children’s home has been based on trusting the Lord on a day-to-day basis and as a result of their trust in God and not man we don’t always know of their need. Last week, the directors, Edgar and Cony, knew that two of the three locations were in need of food, so they led the children in prayer. On the day where it seemed that they would have nothing to eat, Cony went to get a bag of carrots to try and make a soup out of them. Upon her return, she came home to a kitchen full of food (you can see the photos above). Because of a prompting from the Lord, a Back2Back donor contributed money specifically requesting that it be used to feed children in our children’s homes. 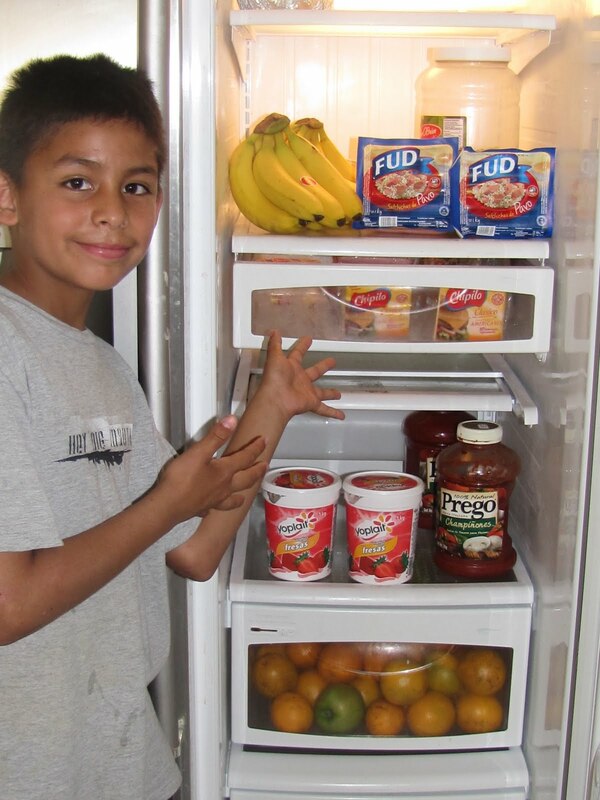 My husband, Greg, had gone to the store and stocked MDA’s shelves and refrigerator with food. Back2Back along with Manantial de Amor were able to give God the glory as we did not know the need only God did. And He orchestrated the timing perfectly to fill the need of the kids. I love that God could do this by Himself – He is big enough. But He put it on the hearts of someone in the US to donate money. And He chose to use Back2Back to be the hands to give, so that in the very time of a great need He could come in to provide for these kids. God cares for these kids. He can prove for you too. Are you struggling to trust Him to provide for you? I pray this encourages you. This is Marcos. Recently we blew bubbles together. I purposely held the bubbles so they wouldn’t spill. After just a short bit it became quite apparent that he wanted to hold the bubbles. I started out with a simple “no”. However, our struggle grew and I realized this little guy was quite determined. So I began my explanation of what could happen if I gave him the bubble bottle. He seemed unimpressed and kept fighting me for the bubbles. As stubborn as I can be, I finally caved and let him have the bubbles. Just as I expected, he spilled the bubbles all down the front of his shirt as the bottle fell to the ground spilling out on the ground around it. Later that night God brought this back to my memory. As I recalled the sequence of events, He spoke these truths to my heart. Often I am like Marcos, wanting so badly to hold onto a situation, a relationship, control over my loved ones, a career, whatever it may be. As long as it is in the Lord’s hands, I can dip my wand in the bubbles and enjoy. However the moment I grab things back and take control, things begin to get messy. I find if I try and manipulate the situation around me when I know God has something different in mind, things get messy. I’ve seen it in my teen years when I wanted a relationship to last longer even after God told me to let it go, or when I thought I knew making more money would make me happier and it didn’t, and now wishing things were different with my mom and not wanting to feel the hurt. God wants differently. God wants to be in control and asks me to trust. Who’s holding the bubbles in your life? 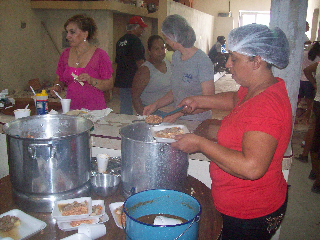 Recently, Back2Back staff, Back2Back partners, Meme and Maru, and some people from Meme’s Rio took a prepared meal to serve families in Rio 3, another impoverished community that suffered greatly during the recent storms from Hurricane Alex. It was quite the experience seeing one women and one man prepare a meal for 300 and travel across the city to serve it to a community they knew nothing about. God was good to us as he lead us there safely. We served 150 people and even spoke to a few families, as we viewed the destruction. The other women spoke how the church/soup kitchen there (supported by Back2Back) was holding regular services and serving three meals a day. Meme, Benny, China, Perla and Beto were exchanging experiences of how the river wasn’t always a friend to them as well. As I listened I remembered a passage from the Bible, 2 Corinthians 1. Paul talks about how God gives us comfort so we could comfort others with the comfort we ourselves experienced from Him. The day was long and full of images I don’t want to forget. But these ladies and one man returned to their home full of the Joy that comes with serving the Lord and sharing in His comfort. Many of you know our car was broken into on a recent trip back home for a furlough this summer. As we were retrieving a police report, I found myself caught in a sea of people at the Shelby County Jail. We were checked, had to walk through three metal detectors, and even had a temporary photo ID made. It was a very new experience to me. It got me wondering about the families that come here regularly to visit loved ones. It got me thinking of the way of life of those who for whatever reason find themselves in a life of crime. Then God brought my thinking to him, or her, or they – whoever it was that stole our things. I wondered what their life was like. What was it like for their family? I realized whether I liked it or not, I was connected to this person. God had me “walking in their shoes” for a bit that morning. I found my anger melting away. I found myself with mercy and concern. God connects us for all kinds of reasons. God has created us to relate to one another and He allows things to happen that connect us. Some connections are simple and strong, like the connection that is made between a baby and its mother or father. Or connections that little kids make over a ball or game. Maybe it’s a quick connection, like the ones that happen daily during normal interactions. The kid that sells you your Starbucks coffee, or the guy who helps you know when a cantaloupe is ripe at the grocery store. And even sometimes he connects us to those who we would never pick to connect. I have found God bring to mind this person more than a few times to pray for them. He has me thinking about the other connections He has for me and wondering if He wants more from me through these connections. What about you? Are you seeking what God would have for you through your connections in your life? She is two months old and yet her due date has not yet passed. She was born prematurely at six months. Janet, her mom, was experiencing a normal pregnancy until at a routine doctor’s visit she learned she was losing fluid. The doctor advised her to admit herself into the hospital so they could monitor her. She chose to stay home because of the cost. Four days later, Janet woke up with blood on her sheets and a puddle on the floor. Scared and worried, she and her mom went to the emergency room. She was taken away to a room and her mom was told to wait. After nearly three hours, the hospital staff returned with a bag of Janet’s clothes and told her mother to speak to someone about how they were to pay for Janet’s hospital stay. That morning word got out and Meme, a Back2Back partner, came to me and asked if I wanted to go with her to the hospital to visit Janet and pray for her. When we arrived, she had been waiting three and a half hours with still no word. Soon after we arrived, they called Janet’s mom inside a tiny office. It was apparent that the news wasn’t good, as she began to cry. They had told her that Janet had given birth to a baby girl who couldn’t breathe on her own and she should prepare for the worst. Then she was escorted out to wait for futher news. When Meme and I surrounded her, she told us the news about baby Melissa. We hugged and cried. In that little hallway, we huddled together and prayed for the health of the baby, for the strength of her lungs, for Janet and her mom and other family. We prayed for who knows how long. When we finished we convinced Janet’s mom that she had to eat something. We stayed with her part of the afternoon before finally returning home. Later when her mom got to see Janet, they shared experiences. What Janet didn’t know then was that at the exact same time that she was pleading to God for us to pray, we were gathered in the hallway of the hospital interceding on behalf of her little girl. When I visited Janet later she shared this with me and I was able to tell her how she can have a personal relationship with God. She too can have a direct line to the Almighty Physician. She was intrigued and I prayerfully anticipate more conversations about what Jesus offers us all. It is obvious to me that God is using this little girl already and I’m convinced that He has great things in store for her life. Would you continue to pray for Melissa’s health? The doctor’s gave Janet oxygen for Melissa however she has yet to need it, praise God. Also pray for the faith of Janet and the rest of her family. There has been a faithful Back2Back supporter, who I’ll call Jill, who has regularly donated money for a little girl named Sarahi. 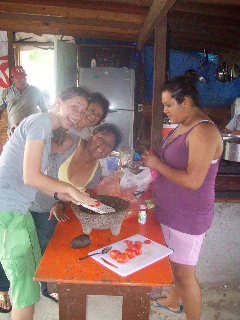 Sarahi lives in the Rio, which is one of the squatter’s villages that Back2Back serves. Sarahi is eight years old and just finishing 2nd grade. Jill has helped to fund Sarahi’s education and provide staples for her family when they were without food and other basic necessities. 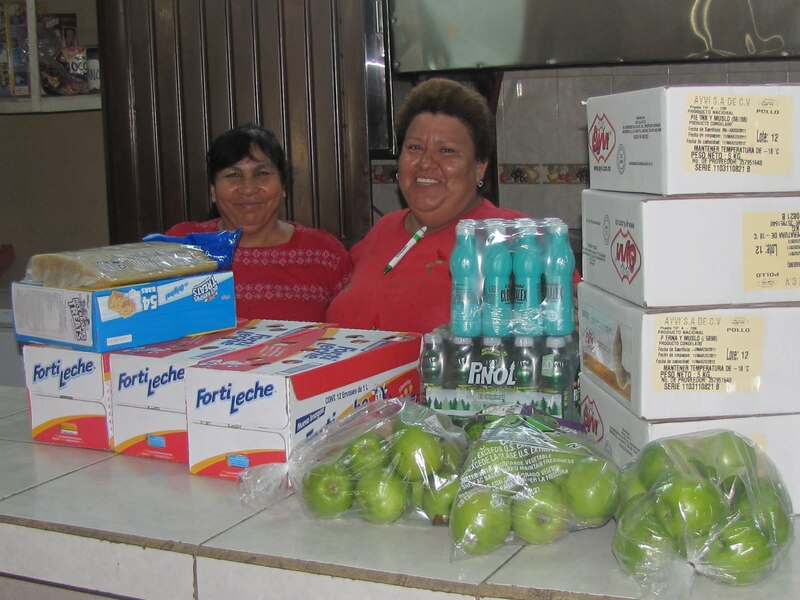 Recently, I told Meme, who helps with our Rio ministry, that I needed to talk to Sarahi’s mother, to see what they needed as I had just received another donation from Jill on their behalf. 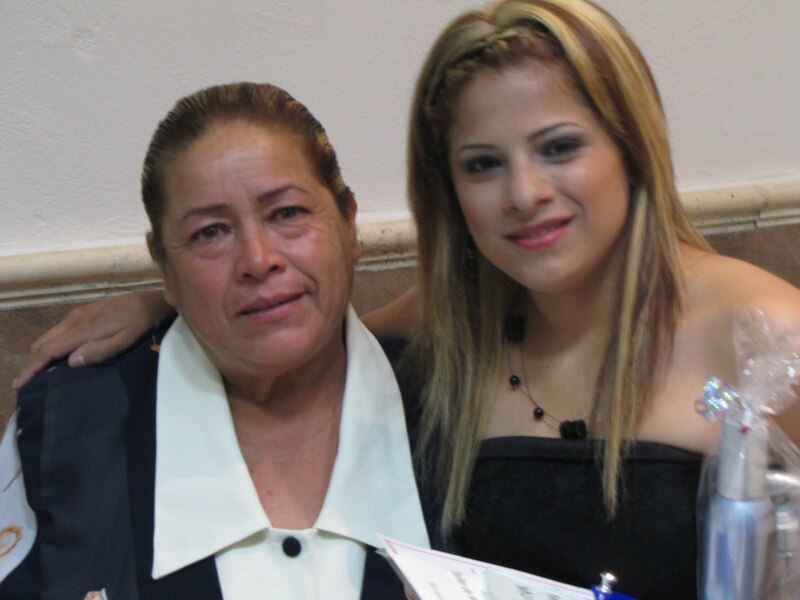 Meme informed me that Sarahi’s mother had kicked her out of the house and that her grandmother had taken her in. Sarahi’s mom is currently pregnant with twins and has another daughter who is a few years younger than Sahari who was allowed to stay in the home. I have had many people, Meme, Sarahi and her grandmother, try and explain this to me and yet it’s still difficult for me to understand how this can happen. I could see the hurt on Sarahi’s face when she asked another woman and myself to pray for her. As I prayed, I told her that this was not a surprise to God and that He had already had placed someone in the states, Jill, to care for her. That was just one way God was showing her that He loves her. I don’t know what a girl that age can understand but her countenance changed drastically after our conversation. As Sarahi learns to trust the Lord, He is showing her how He can shelter her through her grandmother, through Jill and through others like you who are praying for her. Will you take a moment to lift up Sarahi in prayer today? 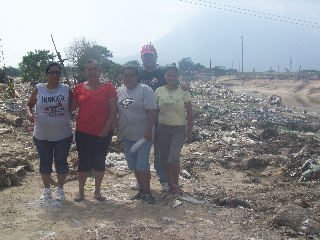 Back2Back partners with a church in Monterrey that serves an extremely impoverished area called Rio III. The community was built on top of an old garbage dump. Families construct shelter by piecing together scraps and pieces of wood from the landfill. Most families live on a few dollars a day; their sole source of income is from collecting the trash surrounding their homes and recycling it. We work with these families, mostly single moms, because they are literally at the cusp of making the difficult decision of whether or not they will choose to place their child in one of the children’s homes. Our goal is to help them to provide for their children’s basic needs, preventing them from reaching the point where they need to drop off their children at one of the homes. This week a group from Back2Back Ministries visited Rio III. We provided food and clothing for about 200 children and 100 women and allowed the woman to pick out a new outfit, thanks to a generous donation of clothing from CAbi. Many of these women are single mothers who have multiple children and work long days. The women who are married often have husbands that are gone all day working. They are so focused on providing for their family that they have very little time or resources to devote to themselves. It’s evident from the looks on the womens’ faces as they wear their new clothes that they have a renewed sense of confidence. “Thank you CAbi for this big blessing,” one woman said smiling at the camera as she did a model-like runway turn. 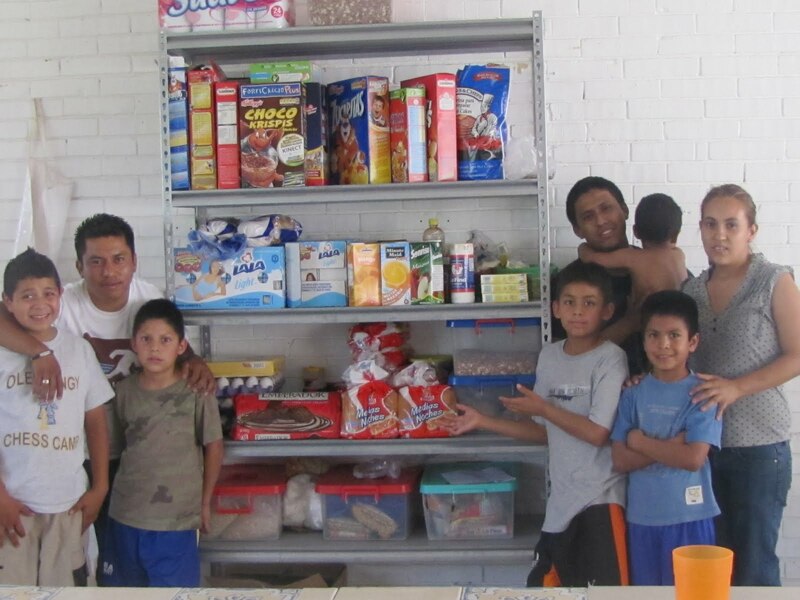 Back2Back Ministries, along with the families of Monterrey, have been so blessed by this outreach. The video below is a visual thank you from some of the recipients of CAbi’s generosity.